INSPIRAL brand has taken the health food shops by storm in the last few years. They pride themselves in their fab tasting products produced with integrity and heart. Each recipe is carefully calibrated for your health and with global sustainability in mind – they love this planet we live on. 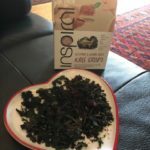 What a wonderfully healthy way to get your chocolate fix – cacao mixed with greens – a superb combo that is not too sweet not too salty, tastes warm and nourishing with a hint of spice, whilst crunchy with a great texture. 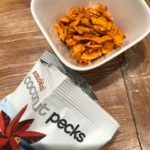 Great alternative to potato crisps and the big bag was gone in a few handfuls! Dangerously Moorish! These look great with the red beetroot clinging to the kale clusters! 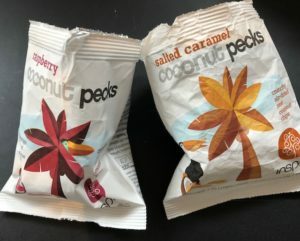 Very mild with no particular flavour punching through these are perfect for anyone wishing to have a healthy snack that doesn’t contain any nuts. Super low in carbohydrate sugars they are balancing for the blood sugar levels and packed full of healthy fats from the sunflower seeds and olive oil. I shared these with my girlfriend over a cup of tea and a good chin-wag at 11am! They we a delight to eat – so up lighting & refreshing. The crisps were zesty and tangy from the lemon with a mild cheesy after taste – from the nutritional yeast. Have to say I really enjoyed them. Very unique and delicious. 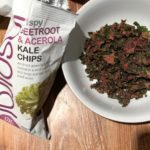 Whilst launching these crisps we have to join INSPIRAL on their mission to…. “go one step further beyond the concept of ‘traditional snacking’ …….inviting us to revisit eating as a sacred act. In doing so we are honouring our body, our temple”. INSPIRAL believe “there’s more to food than how YOU feel because we’re all in this together. Your choices now impact on the world of tomorrow” They are “passionate about wholesome, sustainable, natural food and a healthy planet!” I love the brand not only for their products but for their respect of our planet and desire to nurture it as it nurtures us. INSPIRAL use the highest quality ingredients to deliver a top product. They are a healthier alternative to potato crisps and so much more nutritious. Drying Kale at low temperatures to preserve nutrients takes 18 hours – no mass production involved. 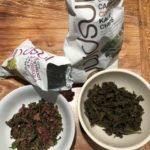 They package their kale chips in the most conscious compostable packaging – no cheap plastics to burden the planet. They sweeten their products with Organic Coconut Sugar or Palmyra Blossom Nectar . This I think I prefer as it is a highly nutritious natural sweetener derived from the sap of the Palmyra Palm tree in Southern India and Sri Lanka. Whilst similar to coconut palm sugar, Palmyra Nectar is far superior in nutritional content. low GI of 35 compared to refined sugar which has a GI of about 58 and apple has a GI of 40! Sugar is just empty calories and insulin spikes. Very low fructose 3.1 g per 100g compared to coconut sugar, which contains 40g per 100g. A little goes a long way and it gives whatever it is mixed to a rich caramel toffee like flavour. Rich in potassium, magnesium and Iron. Also B vitamins, perhaps the only plant based source of B12. 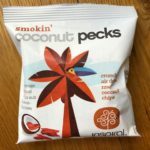 COCONUT PECKS are delicious nutritious – perfect for the small hunger in-between! Made from the purest organic ingredients they are the only raw food state coconut chips on the market. INSPIRAL dehydrate these little nuggets at low temperatures over 18 hours to turn them tantalising crunchy clusters. The dietary fibre in coconut supports your digestive system and helps you feel full to prevent overeating as fat is satiating. Coconuts are very nutritious and rich in fibre, vitamins, and minerals. Coconut is one of the best super foods available. Coconut reduces the risk of Alzheimer’s and can boost brain health. Coconut helps wounds heal faster and is also effective at reducing cellulite. Coconut can naturally boost testosterone levels in men and help balance hormone levels in both men and women. Coconut helps balance both HDL and LDL cholesterol, which improves heart health. Coconut increases nutrient absorption of fat-soluble vitamins like Vitamin D, A and E.
These really pack a raspberry punch – no artificial flavours used here. You can tell they are infused with fresh raspberries at a whopping 40% of the ingredients. The organic beetroot, baobab and vanilla at to the sweetness and stimulate all the pleasure senses in your tongue. Quite remarkable actually how pure and fresh and intense they are. Baobab fruit is high in calcium, vitamin C, potassium, magnesium, zinc, vitamin A, thiamin, B6 and bioflavonoids. It also acts as a prebiotic and is high in fibre. Beets are high in immune-boosting vitamin C, fibre, and essential minerals like potassium – good for healthy nerve and muscle function, and manganese – essential for your bones, liver, kidneys, and pancreas. Beets also contain the B vitamin folate, which helps reduce the risk of birth defects. Being a HUGE BBQ fan these pecks are a great raw, natural, vegan way to induce that vibe! Smoked paprika with a twist of lime together with the cheesiness of nutritional yeast ……………… Smokin’ly satisfying! 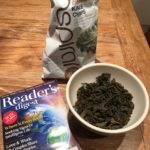 I had them after dinner for a treat – just the perfect amount and not too sweet, meaty clusters which my Cowboy enjoyed too! You should definitely try these. Because of the large amount of antioxidants present in Paprika, such as vitamin A, lutein and zeaxanthin, along with the good dose of Vitamin B6 Paprika helps keep eyes healthy and prevent diseases that damage your eyes. Plus it not only boosts your metabolism, but this red spice can also help reduce your appetite and lower your blood pressure. Limes aid weight loss, improve digestion, reduce respiratory and urinary disorders, give relief from constipation and is good for the skin and eyes. 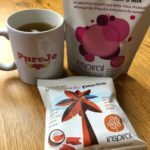 POWERBLENDS are INSPIRAL’s carefully calibrated specific mixes that help you when you need a bit of support, either energy, detox and lots more. Woman’s Mix Power Blend is a supportive, uplifting, replenishing mix of 14 plant powders used across the globe to support women’s specific needs. Taste is great– if a bit too sweet for me – I would rather go all-natural and have no blossom nectar but that is personal taste and I have been sugar free for many years now preferring the tart naturalness these days. 1-3 tsp, well-blended into 300ml of juice, shake or smoothie. Use daily for optimal beneﬁt. Kelp – natural source of vitamins A, B1, B2, C, D and E, as well as minerals including zinc, iodine, magnesium, iron, potassium, copper and calcium. The Detox Mix Power Blend is a supportive, cleansing mix perfect for this ‘sea of toxins’ we life in today where chemical exposure is steadily increasing. 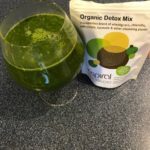 It has become a welcomed addition to my green smoothies when I make them with 7 wonderful herbs an superfoods to help my liver and kidneys detoxify whilst supporting my thyroid, hormones, immune system and more. I would definitely recommend it males and females who want to help their body heal and rejuvenate quicker. Inspiral recommend that for cleansing, it is best taken for 1-3 months and then rest. 1tsp, 1-3 times per day, blended into 300ml of water, juice, shake or smoothie. Turmeric root (11%) – powerful anti-inflammatory and antioxidant. Protects the heart, is good for arthritis, brain boosting and helps fight diabetes and cancer. 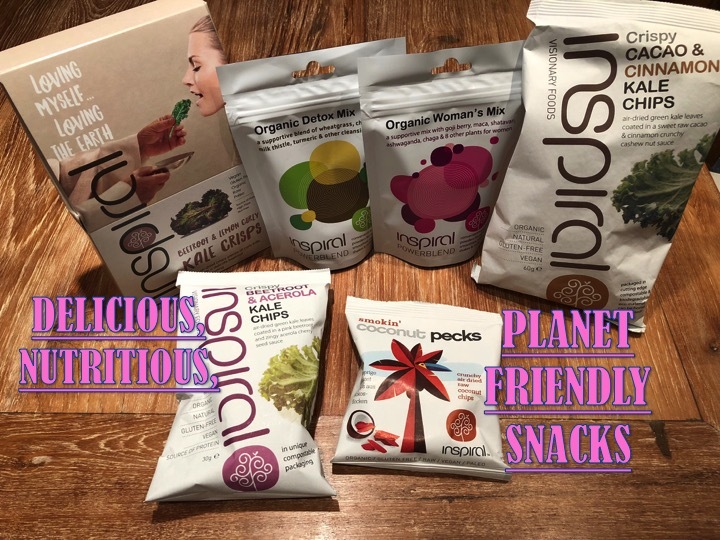 These are just a few of the INSPIRAL deliciously nutritious and planet friendly products within their ranges. Be sure to check them out and give them a try – I know you will find many that tantalize your taste buds like I did. 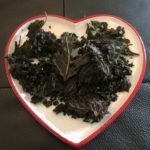 You can eat them guilt free as they are good for the body and INSPIRAL are not just after profit but want to make a difference to the world we live in helping us to be more ecofriendly and sustainable.